I was fortunate to be invited to speak at the American Society for Experimental NeuroTherapeutics (ASENT) annual meeting on February 28, 2013 in Bethedsa, MD. 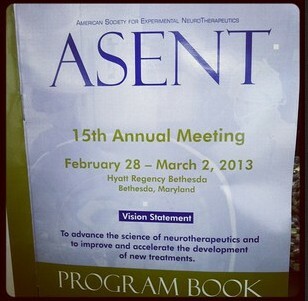 I was fortunate to be invited to speak at the American Society for Experimental NeuroTherapeutics (ASENT) annual meeting on February 28, 2013 in Bethedsa, MD. What’s unique about this nonprofit organization is that it consists of representatives from the key stakeholder areas: healthcare, academia, biopharma, patient advocacy and government. At their event I met physicians, nurses, patients, advocacy leaders, brand managers and FDA officials. I presented as part of an afternoon discussion on the “Use of the Internet and Social Media to Conduct Clinical Trials” with Russell Katz, MD, U.S. Food and Drug Administration (FDA); Joseph Kim, Shire Pharmaceuticals; Craig Lipset, Pfizer; Joanna Napp, HealthTronics; Lori Sames, Hannah’s Hope Fund; and Nancy Santilli, HealthTronics. Dr. Katz, director of the Division of Neurology Products in the FDA’s Center for Drug Evaluation and Research, started off by admitting that not only was he not an expert in social media, but he doesn’t even have a smart phone! He’d asked around to see if anyone at the FDA was investigating the use of social media specifically for clinical trials and did not find anyone. Dr. Katz noted that the overarching idea is that the existing advertising rules apply, but it’s not yet clear how. He said, “The agency is working on it.” He mentioned that the FDA is working on an app to accept MedWatch reports via phone. Dr. Katz said that using social media for real time adverse event reporting, patients supporting each other and helping with trial adherence were all positives . Dr. Katz didn’t feel that designing a clinical trial via crowd sourcing would be a regulatory issue and mentioned the example of Transparency Life Sciences multiple sclerosis trial. He explained that using social media for recruitment was fine, but that the real issue relates to large numbers of patients interacting during a trial. On this same topic, Craig showed a blog on Fingolimod (where patients were sharing specific detailed info on how to get into a trial) which generated a lively discussion. Another conversation was around the ability for patients to “blind break” a trial via their social media use. Participants have always done this, but with social media it can happen on a much larger scale. Many of the other sessions were also fascinating and I’ve provided a summary of a few. What motivates patients to participate in trials? Petra Kaufmann, MD, from the National Institute of Neurological Disorders and Stroke talked about the challenge of clinical trial patient recruitment and retention. 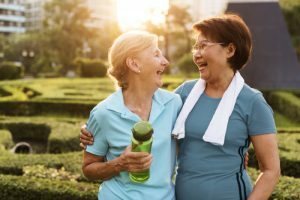 The Neuropathy Association did a survey and learned that people would be motivated to participate by access to leading doctors (35%), access to new treatments (35%) and helping others (25%). Survey respondents identified the barriers as lack of awareness, ability to travel and hidden costs, such as missing work. Dr. Kaufmann shared quotes from patients who were frustrated because specifically asking doctors about trials didn’t work for them. She recommended including patient feedback to ensure the burden is acceptable, planning for reimbursing hidden costs and sharing information back with patients. Dr. Kaufmann advised increasing awareness of clinical trials by including patients in the trial design to ensure that the questions being asked and the outcomes matter to patients, and that information flows back. She recommended having patients help develop the clinical trial communication plan to ensure patient-friendly language and that the information will be shared in the appropriate places. Dr. Amy Chappell from Eli Lilly explained how they put these ideas into practice and how their process includes patients and advocacy groups at the beginning of trials. She illustrated how patients and doctors don’t always agree, so it’s important to ask both groups. Bray Patrick-Lane, MFS, PFO Research Foundation, gave a powerful personal example of how communication between industry and clinical trial patients is not always ideal. She has migraines and was in a clinical trial with a device implanted and only learned about the discontinuation of the trial via a news report. Patrick-Lane noted that organizations create tools for the public domain which is what biopharma should also do. Patients get frustrated when things aren’t shared in public domain. She highlighted the new focus on rewarding results not just the process. Examples include Prize4Life and Clinical Trials Transformation Initiative. Robin Elliott, MA, Parkinson’s Disease Foundation, talked about the small print of the medication prescribing information and that the lengthy information is intimidating to patients who might not be able to accurately assess the risks. Elliott described how patient activists will help spread information to non-activist patients. He explained that caregivers and family members play an important role in medication choice. How do doctors decide what to prescribe? 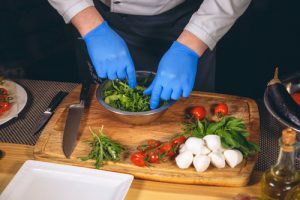 James Simsarian, MD, a key opinion leader on multiple sclerosis (MS), discussed the process for making medical decisions. He explained that for non-life threatening diseases the patient’s family and online research have big impact. According to Dr. Simsarian, a treatment decision often comes down to a one on one conversation between the doctor and the patient. His patients often ask the question, would I be better doing nothing? Dr. Simsarian quoted a study that showed that MS patients with a higher level of disability were more willing to take risks. Personally, he likes drugs after they’ve been on the market for 18 months. He noted that doctor bias is determined by how this drug worked on the last few patients. An audience member raised that the “hassle factor” also plays a role in what to prescribe. For example, how much time will I have to take to explain this medication? 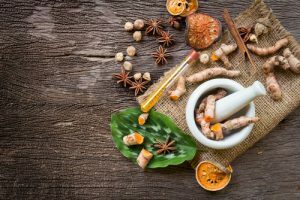 How many calls on side effects will I get? Dr. Katz also presented “Integrating Patient Input Within the Drug Approval Process.” The Food and Drug Administration Safety and Innovation Act (FDASIA) made provisions for increased patient participation in medical product regulation.